With my wife and daughter unexpectedly out of town last November, I was suddenly faced with the reality of preparing a Thanksgiving feast for myself and my son. Finding the right-sized “turkey for two” wasn’t easy, and timing the entire meal around watching the Redskins play the Cowboys was tricky to say the least. But we made it work and everything was on the table precisely at the start of the halftime show. I don’t want to brag, but the desert was out-of-this world and far more palatable than than the game’s outcome: Dallas won. Now, despite the very real prospect of ordering take-out following a spectacular failure (or fire), I found myself feeling incredibly grateful that for all my concerns, sourcing the meal was not one of them. That’s not the case for many of our fellow Americans, for whom putting food on their plates is a ceaseless struggle. 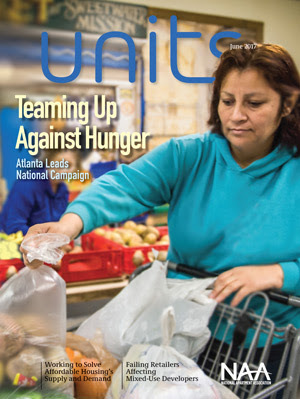 It’s for this reason we’re so proud of our members and our industry for their efforts to end hunger, including those made by the Atlanta Apartment Association’s (AAA) annual Food-A-Thon, whose endeavor helps the Atlanta Community Food Bank provide 58 million meals to children, families and seniors each year. Click the link below for more on how AAA and its hundreds of incredible volunteers has operated this tremendous event since 1978.